Will polar bears survive in a warmer world? UCLA life scientists present new evidence that their numbers are likely to dwindle. As polar bears lose habitat due to global warming, these biologists say, they will be forced southward in search of alternative sources of food, where they will increasingly come into competition with grizzly bears. To test how this competition might unfold, the UCLA biologists constructed three-dimensional computer models of the skulls of polar bears and grizzly bears  a subspecies of brown bears  and simulated the process of biting. The models enabled them to compare the two species in terms of how hard they can bite and how strong their skulls are. "What we found was striking," said Graham Slater, a National Science Foundationfunded UCLA postdoctoral scholar in ecology and evolutionary biology and lead author of the research. "The polar bear and brown bear can bite equally hard, but the polar bear's skull is a much weaker structure." 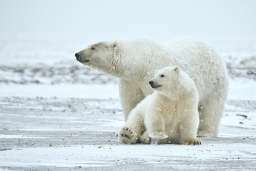 The implication is that polar bears are likely to lose out in competition for food to grizzlies as warmer temperatures bring them into the same environments, because grizzlies' stronger skulls are better suited to a plant-rich diet, said Slater and Blaire Van Valkenburgh, UCLA professor of ecology and evolutionary biology and senior author of the research. "The result for polar bears may be lower weight, smaller and fewer litters, less reproductive success, fewer that would survive to adulthood, and dwindling populations," Van Valkenburgh said. "Then you can get into an extinction vortex, where a small population becomes even smaller in a downward spiral to extinction. "To people who say polar bears can just change their diet, we are saying they will change their diet  they will have to  but it probably will not be sufficient for them, especially if they are co-existing with grizzly bears. Their skull is relatively weak and not suited to adapting its diet. We did not expect to find what we found." "This is one additional piece of evidence that things look pretty bleak for the polar bear if current trends continue," Slater said. The research, federally funded by the National Science Foundation, was published this month in the online journal PLoS ONE, a publication of the Public Library of Science. Polar bears are a "marvelous example of rapid adaptation to an extreme environment," Slater said. "The fact that we can lose them equally as rapidly as a result of human-mediated climate change is rather striking. Polar bears are very well suited to do what they do, but they are highly specialized and not well suited to doing much else." It could take quite some time for polar bears to go extinct, Van Valkenburgh said, but they are likely to become much more rare than today. Polar bears are losing habitat as a result of global warming and the associated loss of arctic sea ice, which they use to hunt for seals, Van Valkenburgh and Slater said. But could they survive on an alternative food source? "Our results suggest that this is not too likely," Slater said. "The polar bear's skull is a relatively weak structure that is not suited to diets consisting of a lot of plant material like that of the brown bear. As climate change continues, polar bears will be forced to move south in search of resources, while brown bears move north as their climate becomes more mild. When these two species meet, as they have already begun to, it seems that brown bears will easily out-compete polar bears. Our findings should serve as a warning that polar bears may not be flexible enough to survive if current trends continue. "Chewing a lot of vegetables takes quite a lot of force to grind up," Slater said. "Grizzly bears are well suited to eating these kinds of food, but the polar bear is not well suited for it. The grizzly has a much more efficient skull for eating these kinds of foods." In Canada, grizzly bears are moving north and are already in polar bear territory, Van Valkenburgh and Slater said. The life scientists  whose co-authors include UCLA undergraduates Leeann Louis and Paul Yang and graduate student Borja Figueirido from Spain's Universidad de Malaga, Campus Universitario de Teatinos  studied two adult male skulls from museums, one of a polar bear from Canada, the other of a grizzly from Alaska. They built 3-D computer models of the skulls and then analyzed their biomechanics. "We can apply muscle forces to the skull to simulate biting, and we can measure how hard the animal could bite. We can measure stress and strain in the skull as well," Slater said. "We found that while the stresses in the grizzly bear skull are relatively low, the same bites in the polar bear produce much more stress. Combined with other evidence from Blaire's laboratory, this tells us that the smaller teeth of polar bears are less suited to diets that consist of plants, grass, vegetation and berries." "Polar bears would not be able to break up the food as well in their mouths and would not digest it as well," Van Valkenburgh said. In the timeline of evolution, polar bears evolved from the brown bear very recently, and the two are very closely related, Van Valkenburgh and Slater said. Genetic studies indicate that the split between polar bears and brown bears occurred only 500,000 to 800,000 years ago  the most recent split between any of the eight bear species. Despite the recentness of the split between these two species, their skulls and teeth are extremely different, probably as a result of where they live (arctic versus temperate regions) and the differences in their diets. Grizzly bears have very large molar teeth, while polar bears have teeth that are much smaller. Polar bears eat seal blubber, which is soft and does not require much chewing, while brown bears consume many plants. The biologists investigated the rate at which skull shape has evolved in the bear family. They found that the rate of evolution in the branch of the bear family tree leading to the polar bear was twice as fast as the rates in other branches of the tree; it appears that skull shape evolved extremely rapidly in polar bears. Polar bears probably evolved very rapidly in response to glacial climates during the ice ages, Slater said. "You don't see many bears that look like polar bears, and the difference in skull shape evolved very rapidly," Slater said. Let's see now. Polar bears split from the family tree over 500,000 years ago, and in the intervening time, there have been how many interglatial periods, including what must have been many that were warmer than today, like the Medieval Warming period. And yet they're still with us, but if we don't immediately restructure our economies back into the Stone Age, say the warmists, these adorable critters will go extinct. This type of alarmism is prevalent in other fields too. If we have to cut government spending, what are we told has to go - administrators, regulators, no-show union jobs? Nope - cops, firefighters, teachers. Apocalypsism shares traits across many disciplines, it seems. Pick the cutest or the most life threatening alternatives and scare the populace into doing what you want. And if this was happening without human industry it would be "natural" I suppose. Or would we be just as horrified at nature kicking off an overspecialized dead end? More global warming BS. Polar bears are more numerous than ever (last 100 years). Therefore warmer is better for polar bears. If we want more polar bears (and we don't) just stop Eskimos from shooting them. This is almost proved false. We've found some instances of competition, however the two species are barely seperated. As geo said, 500k years. This means, as we've found rather often, polar bears and grizzly bears will hybridize. The loss of their habitat will ceretainly ensure their species will go extinct, but not through their catastrophic death. Pounding the polar bear issue is probably one of the worst things that the AGCC political lobby can do as it is far from science and not backed by observational evidence. We shouldn't be happy that they're losing their habitat, nor should we speed the loss of their habitat, but this is a claim that is being made entirely falsely. All the students of Rush Limbaugh and the conservatives (what exactly do they conserve?) say this with me (in a high whining voice) "But they can swim." In actuality they probably are doomed as a species but most will probably survive and interbreed with their brown bear cousins when they move south as Skeptic says. "As polar bears lose habitat due to global warming, these biologists say, they will be forced southward in search of alternative sources of food"
Uh, you guys are all missing the obvious error here. I guess you all wear blinders when you read these things. If climate warms enough to significantly warm the polar bear habitat, why would the polar bears move south? Food sources that currently can't handle the cold arctic climate will expand north if the arctic warms (as it did in the last interglacial). That's history folks. The arctic was biodiverse, not barren, the last time around. Large bear species will thrive in expanded habitats. Bears will not decline, but the relative abundance of one type of bear might. That isn't a disaster, it's a net gain for bears, just not the white kind. These guys are just one more example of the bias in 'scientific' journals towards environmental special interest groups. The evidence shows polar bears have been moving south as they're more adaptable to the heat than their future food sources are adaptable to the cold. Polarbears have been found with squirrels and other woodland creatures in their stomaches. They're moving south to get the food now, because they're not going to wait in the cold while their fat rich supplies wane. They will move south, but the food will move north eventually too. I'm talking about longer time scales than you are (again), like centuries. If the arctic becomes sub-arctic or even temperate, it will expand the available habitat of many flora and fauna northward. Over-specialized nich predators are always the first to go when things change. They are also the last to arrive to a new area. They are hardly the best type of species to use as a yardstick for biodiversity and environmental health. It's probably better to use something at the base of the pyramid, like ants, rodents, and birds. Why do AGW "researchers" think the earth is some sort of steady state where the climate is identical year after year and each species has the same number of animals year after year? We ought to transplant a breeding population to the south pole. Lots of ice and food, no competition. Uh, because there is no land under the ice? Oh, I forgot, the right thinks they will be ok because they can swim. Heard that on Fox by the way, they must think they are fish and can just float in the arctic and dive for food like whales. "because they can swim. Heard that on Fox by the way"
Thanks for keeping me updated. Since I don't watch Fox much I miss out on lots of great information I guess. Maybe I should get cable TV, you know, so I can stay informed? You know, they can move inland without moving south, right? In fact, they could even move north in some cases. There are lots of people who claim that temperate and tropical species are migrating north in response to rising temperatures. Maybe these are off-setting effects. The polar bears can eat the armodillos when they complete their expansion into Alaska. That was a deliberate exageration you know. Seriously, I think we can just start releasing environmentalist into the arctic wild. The bears will have plenty of food and the environmentalist can feel like they are doing something good for the bears. It's a win-win for everyone. It's obvious that you watch the hated Fox so much that you would just catch this loopy reference that just happened to apply to this post. How about a cite (to Fox, not the Daily Kos or Media Matters)? Or perhaps some context, like who said it and what else they said. Otherwise, I say you made that up.